The problems of a maternity ward seem a long way from the conventional view of engineering, but Dr Tim Rowsell has become interested in the problems involved with monitoring the heartbeats and movements of the unborn child. There are approximately 50,000 perinatal deaths each year in Western Europe, many of them unexplained. Many more babies are born handicapped, as a result of fetal sickness undetected during pregnancy. Dr Rowsell hopes that by developing a technique for non-invasive monitoring of the fetus over an extended period of time, this number can be reduced. Fetal heartbeats and movements give rise to microscopic vibration of the maternal abdomen. Many of these sounds are outside the range of normal hearing. To record these vibrations, Rowsell has designed a microphone incorporating an optical sensor. This makes non-touch vibration recording possible. 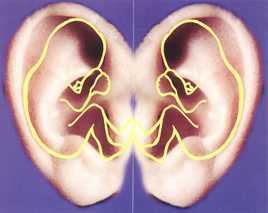 Signal-processing techniques will be employed to isolate and analyse the vibrations caused by the fetus and allow simultaneous monitoring of fetal heartbeats, breathing and movements. The complexity of this operation may be realised by the fact that the vibrations have amplitudes of the order of microns, in the frequency range 0 to 200Hz, and occur in a very compliant system. A prototype microphone is currently being tested. The long-term goal is to produce a system, unobtrusive in use, with several microphones to feed data to a central processing unit. This could be used safely by a pregnant mother at home and the results transmitted to a clinic for remote monitoring, thus avoiding the trauma and expense associated with frequent visits to a clinic. Other applications of the technique (non-contact recording of small vibrations) include acoustic monitoring of adult heart and blood flow sounds. Use of improved sensor technology in this area may provide early indication of circulatory dysfunction. This work is being funded by the British Heart Foundation.